When you get surgery, there is always the risk that internal and external factors or faulty equipment might cause some complications during treatment. It is no different with dental implants. Implants are intended to be a permanent solution to replace missing or damaged teeth. They are by far the best alternative for people who don’t want removable dentures or bridges. The implants work by anchoring artificial teeth into your jaw bone, so you can eat or drink whatever you want – without people knowing that those are not natural teeth. For the most part, dental implant surgery is a smooth procedure and the results are impressive. However, patients can experience complications and setbacks during treatment. To know more about the complications of dental implants, the causes and solutions, continue reading on so that you can make a well informed decision regarding your surgery. The most important thing to keep in mind is that the surgery and recovery is different for everyone. About 95% of dental implant surgeries are performed without any complications – this rate can even go up to 98% if the patient does follow to a T the aftercare rules. If there are any issues, they can typically be cared for easily. The key is that if something doesn’t feel right, you must contact your dentist or oral surgeon as quickly as possible to correct the problem. Remember that the faster you consult your dentist, the more likely it is that you will be able to use the same implant and not cause further damage to your jaw, gums, or teeth. to ensure that you practice good oral hygiene throughout and after the procedure. It won’t happen right away, but will continue to strengthen and connect for several months after surgery. If the implant does not fuse to the jawbone, we consider it is a “failure.” It is the most common complications of dental implants but dentists know how to decrease its probability. 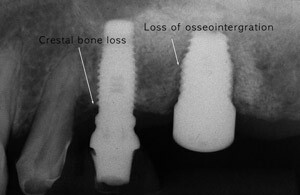 A failure occurs when the implant is mobile, falls out of the mouth, or shows signs of bone loss (>1 mm in the first year; > 0.2 mm in the second). if there is an adverse reaction to the anesthesia. Bone density is key to the success of your implant – you must have enough bone volume and density in order for the implant to integrate properly. If a patient doesn’t have the required bone height, width, or length, then you may have to undergo other procedures like a bone graft or sinus lift. These will add some costs to your bill. An infection, or peri-implantitis (infection around the implant) , occurs when you have bacteria present during or after your surgery, most often because of improper dental hygiene. During perio-implantitis, your gums and/or bone will swell around the implant. If not treated quickly, this inflammation can result in the loss of the implant. Usually if a treatment is not possible, the implant is removed. Patients who have diabetes, smoke, have thin gums, or those who do not practice good oral hygiene are more likely to develop this problem and lose their implant. This problem is rarer, but it is still possible. It occurs when the tissues or nerves surrounding the implant have been damaged or if the implant has been placed too close to a nerve. In that case, chronic pain like tingling or numbness in your tongue, lips, gums, chin, or cheeks would be a sign of some sort of nerve or tissue damage. Depending on the severity of your situation, this damage may not be permanent and may go away once the implant is taken out. Of course, let’s be clear, tissue damage is normal during surgeries, but you have to make sure that this is not out of the ordinary. Bleeding or pain that goes longer than a few days or is intolerable is a reason to contact whoever did your surgery immediately. The best way to avoid this problem is to make sure that your dentist is experienced, as the cause is usually inexperience or a bad planning with the appropriate CT scans. While not all the time, some oral surgeons will perform immediate loading during dental implant surgery. Immediate loading is a one step treatment procedure by which the crown and abutment are placed in directly after the titanium post is inserted in your jawbone. this all-in-one procedure is usually only performed on patients that have strong bones, because it requires the bones to be able to handle more pressure. The most common procedure for implants involve at least 2 steps so that the implant has time to integrate with the bone before attaching the abutment and the dental crown. However, some patients don’t want to wait and prefer to do everything in one day because it is quicker, has a shorter recovery time, requires less care, and in some cases, can be cheaper. So, in a nutshell, overloading simply means that the implant failed because the pressure or force that was placed on implant was too much because of the abutment or crown being attached right after the post was inserted. The forces on the implant would then hinder the osseointegration process. Sinuses aren’t exactly in your mouth, they are above your mouth on each side of your nose but that doesn’t mean that they can’t cause big problems for your dental implants, especially if you need implants in your upper jaw. Sinuses and insufficient bone quantity or height in the upper back part of your jaw can make the procedure difficult, even to experienced dentists. In order to cope with this situation, your dentist need to “create” a stronger foundation. He or she may perform something called a sinus augmentation or sinus lifting. During augmentation, the surgeon will lift the existing bone into the sinus space and create more room for a bone graft. The result will be thicker, stronger bone in that area to support the implant. Without this sinus procedure, the implant could protrude into your sinus cavity, and you could end up with an infection or inflammation. Luckily, an x-ray or a CT – scan can easily reveal the problem and you can get corrective surgery accordingly. The best way to avoid problems with your sinuses is to talk about any problems you have had with your sinuses and get adequate testing. Foreign Body Rejection: your body can reject your dental implant, similar to what happens with organ transplants. Your body may see your implant as a foreign object and try to push it out. Failure of the Implant: Though the implant is made of titanium metal, it can still bend, warp, or break. This is not common, but it can still crack or fracture. Damage occurs when there is some sort of sudden impact like a direct blow to the face. Excessive pressure over time, such as grinding, can also deteriorate the implant. Allergic Reaction: The titanium material that is mostly used can have trace amounts of nickel. It is rare, but you can have an allergic or inflammatory response to the implant. You could experience several symptoms such as itchiness or Chronic Fatigue Syndrome. If you are worried about allergies, you can undergo the MELISA test. This is a test that will check whether you are allergic to titanium or not. Primary nerve in the lower jaw, being impossible to locate, which could be a risk during surgery. It is important to remember that even if some of the points above do apply to you, keep in mind that in most cases, dentist can find smart ways to get around them with either additional procedures ( bone grafting, sinus lift), cooperation with your doctor, the use of better imaging service etc…. If you really want implants, and as long as you are commited to following his or her recommendation, there should be ways for you to get them. Do not panic if you think your implant has failed – it does not mean that all is lost, especially if you contact your dentist quickly enough. The first option would be to check if building up the bone around the implant could fix the problem. If not, then the implant would have to be removed so that everything can heal up, and then an implant would be placed again. The whole healing process can take up to a year, especially because your dentist will likely be cautious after this failure. Depending on your situation, you may have to undergo a bone graft procedure, especially if the problem had to do with a lack of bone density in the first place. You are otherwise unsuited for implants. The best way to know the answer is to get another professional opinion. You would need to go to someone else that has a good reputation when it comes to implants – he or she will be able to look at your implant and explain what happened. Consult a lawyer to determine if you have the grounds to sue for malpractice or negligence. If you were the cause of the problem, either due to your own bone issues or improper care, your dentist will tell you about other options that you may have, including dentures or bridges. Continuing to try something that won’t work can hurt you in the long run and be very expensive. Most dentists will help you out if there is implant failure, either by recommending a specialist, giving you credit towards another procedure, or a complete refund. The integrity of your dentist will speak volumes here.